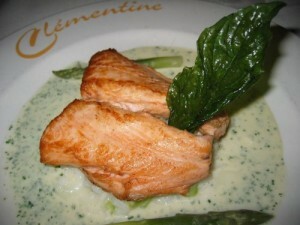 If you love fish, but do not know how to cook salmon in the oven, you have come to the right place. This fast and easy recipe will have you cooking like a gourmet chef in no time. Salmon in the oven just might become your signature dish. Call it what you will but I have always called mine “Easy Baked Salmon”. Preheat your oven to 350 degrees. Season the salmon with the lemon juice and pour the spices evenly on both sides. For a more exotic flavor, leave the skin on the salmon. Let the salmon marinate for up to 30 minutes. Bake your fillet for 30 minutes. Be careful not to overcook, as it can become tough. If your oven runs a bit hot, you might want to check the salmon after 20 minutes. Serves 2. This wonderful fish dish is loaded with Omega 3 fish oil, and is great with steamed rice, and a big green salad. Make some home-made lemonade, and your guests will never want to leave.